Complete says it all. Not sure which eye drop can handle all your symptoms? Similasan has wrapped up the 6 most common eye discomforts into one great formula. 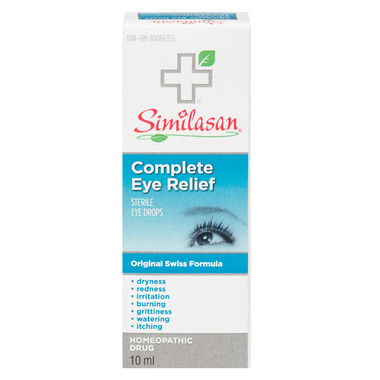 Similasan Complete Eye Relief is a natural eye drop designed for multi-symptom relief and extended use. Many other eye drops have vasoconstrictors or harsh chemicals that may actually worsen symptoms if used more than directed. Complete Eye Relief works in harmony with your body to boost your natural defenses, so you can feel good about using it on you or your child. It is also gentle enough to use as needed when symptoms occur, making it a perfect addition for every medicine cabinet. Try Similasan and feel good about helping your eyes feel better. Similasan Complete Eye Relief eye drops work to soothe, moisturize, and temporarily relieve symptoms including redness, burning, watering, grittiness, dryness, and irritation. How to Use: Adults and children ≥ 12 years: apply 1-2 drops, up to 6 times per day. Children 1-11 years: apply 1 drop, up to 6 times per day. Acute dosing: 1 drop in the affected eye every 15 minutes for a maximum of 3 hours. Remove tamper-evident seal from neck of bottle. Twist cap off bottle. Squeeze plastic dropper to release drops into eye. Apply according to the information above. Replace cap after use. Ingredients: Medicinal ingredients: atropa bella-donna, belladonna* (whole plant) 6x; euphrasia officinalis 3c, euphrasia 3c (whole fresh plant) 6x; hydrargyrum bichloratum, mercury (II) chloride 6x, Non-medicinal ingredients: purified water, sodium nitrate, borax, boric acid (as buffering agents), silver sulfate (as preservative), *containing 0.000002% alkaloids calculated as hyoscyamine. Warnings: For external use only. Initial exacerbation of symptoms may occur. Use only if bottle seal is intact. Replace cap tightly after every use. To avoid contamination, do not touch the tip of the container to any surface. Discard open bottle after 30 days. Contact wearers: consult a health care practitioner prior to using. Consult a health care practitioner before use if pregnant or breast feeding. Keep this and all medicines out of the reach of children. In case of accidental overdose, get medical help or contact a poison control center immediately. Stop use and ask a doctor if: Symptoms worsen or persist for more than 72 hours, changes in vision occur or you experience eye pain. This is the first eye drops I have found in years of searching that have helped my dry eyes and pinguecula, (fat deposits on the eyeball), without eventual irritation.